Are TripAdvisor's Sponsored Placements A Good Idea? 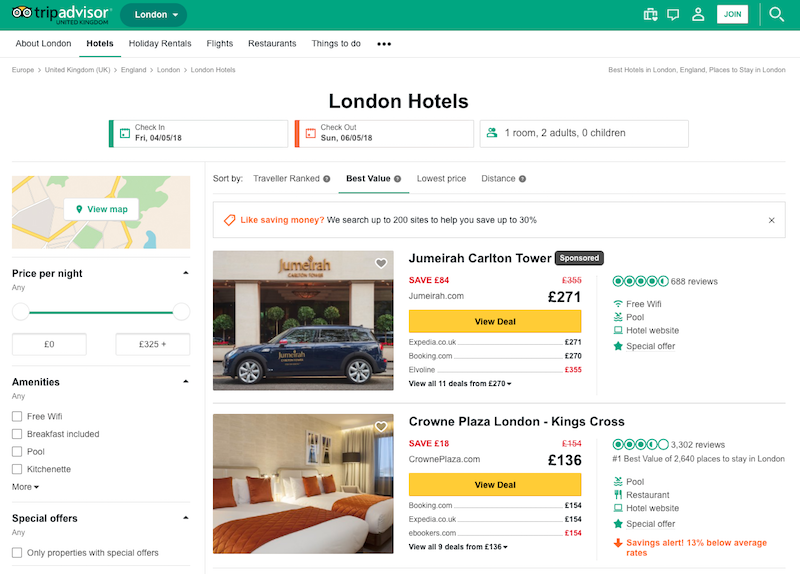 TripAdvisor has announced its official launch of Sponsored Placements, a new form of advertising on the site which will allow paying hotels to appear at the top of a user's search results. Until now, TripAdvisor search rankings have been solely determined by a closely-guarded (and oft-contested) algorithm based on the quality, recency and quantity of user reviews. With Sponsored Placements, comparatively low-ranking hotels will theoretically be able to top the listings over higher-rated properties. These advertisements will be clearly labelled to users as 'Sponsored'. 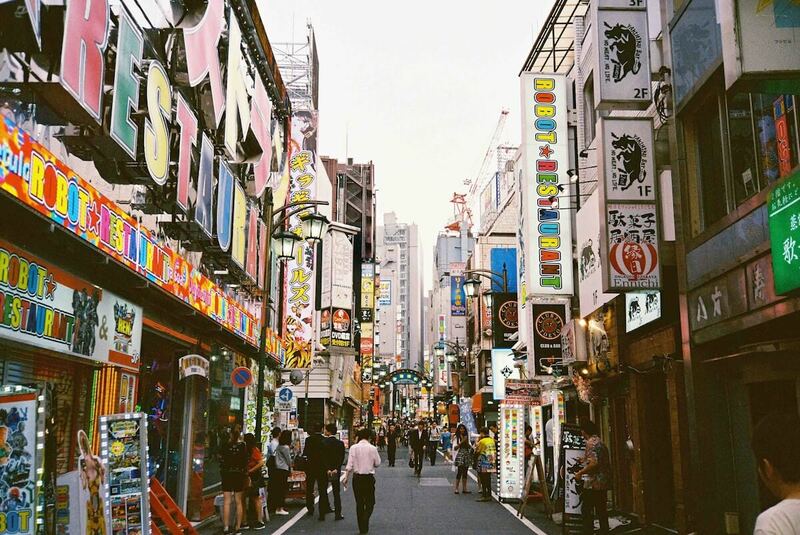 The global rollout of Sponsored Placements follows a three-month beta period in which over 10,000 property owners tested out campaigns, according to TripAdvisor. The company introduced a similar programme for their restaurant listings last year. So, what new opportunities do these ads present to hotels? And do hoteliers risk paying for highly-qualified traffic to be diverted to an OTA? The new ads are differentiated from the rest of TripAdvisor's listings by a grey 'Sponsored' label next to the name of the hotel. Different ads appear when you refresh the page, or choose a different sorting category. Aside from the grey label, the ads look the same as the organic listings beneath. It is not immediately clear, for example, that when sorting by 'distance' the sponsored listing at the top of the page is not the closest to the city centre. This closeness in appearance to organic listings is in line with how Google display their sponsored listings now, as opposed to the clearly demarcated 'yellow box' ads of a few years ago. It will be interesting to see if TripAdvisor follow Google's lead in making paid listings almost indistinguishable from organic - for example, by reducing the size of the 'sponsored' tag. Whereas Google ads used to be consigned to the side of search results, they now frequently make up the entirety of above-the-fold listings. If Sponsored Placements prove to be a successful revenue driver for TripAdvisor, search results pages on the review site could well go the same way. It will be interesting to see if this harms consumer trust in what is ostensibly an unbiased reviews site, or whether users are by now so accustomed to sponsored content that it is accepted as 'part of the experience'. In any case, the news is unlikely to be received well by hoteliers at those highly-ranked properties who are now sitting beneath paying advertisers (with lower scores) on the results page. On the face of it, though, Sponsored Placements present a great opportunity for hotels to increase their visibility on the 'number one most-visited site prior to booking travel.' The new ads offer hoteliers the chance to get in front of potential guests that, crucially, haven't chosen a purchasing channel yet. However, hoteliers will have to weigh up the benefit of this visibility against the likelihood of guests then going on to book their rooms on a listed OTA. Will hoteliers be paying for OTA bookings? While hoteliers can now pay to get their TripAdvisor business listing seen by potential guests, this is not the same as directing traffic to their own website. Guests are still free to choose any of the offered rates and channels on which to complete their booking - and the vast majority of channels available are OTAs. In the image above, we can see that the Waldorf Astoria Beijing has sponsored a listing that then highlights Expedia as the booking channel, despite the rates being the same. Hotels paying for a Sponsored Placement are not necessarily paying to be ranked highly in TripAdvisor's metasearch listings. 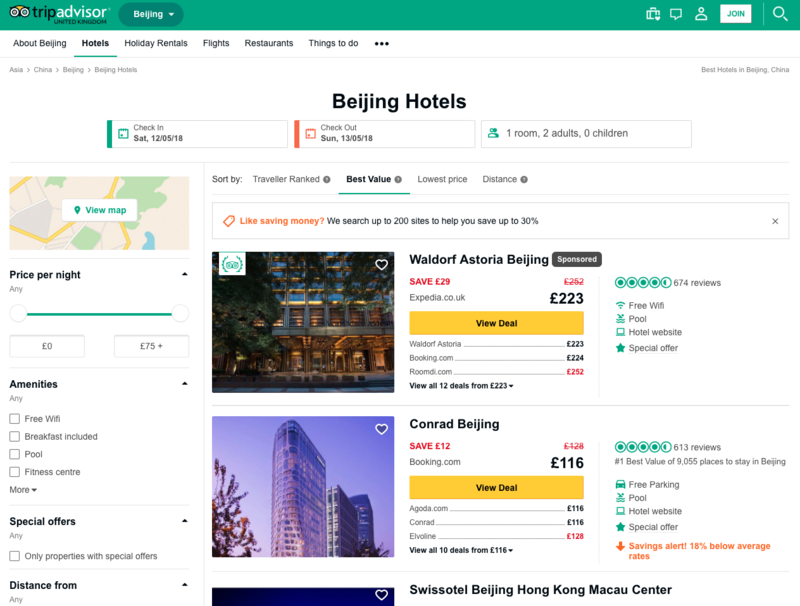 Many hotels choose not to invest in TripAdvisor's metasearch offering at all, believing it more economical to allow OTAs to pick up the cost of those incremental bookings. It is interesting to see many hotels choosing to use Sponsored Placements don't have a metasearch listing, meaning any booking made as a result of the sponsorship will almost certainly go to an OTA. The incremental volume of bookings they receive may well be worth it - but hoteliers should examine the likely impact on their OTA commission payments, as well as the CPC spend on TripAdvisor, in order to make sure the ROI is worthwhile. Sponsored Placements will not be the advertising medium for everyone, and hotels should approach each campaign on a case-by-case basis. While some may generate incremental, direct bookings, others may direct people already aware of your brand to book elsewhere. We'll be watching with interest this latest addition to the hotel industry's advertising mix.